Life is really moving from one position to another just as music is the space between the notes. When asked, I say I teach space in the body. we Design to Align and help students create distinctions about their movement patterns so that they can dissolve old habits and choose better ones. Inattentive posture habits, or demands on the body thru highly skilled activity such as ; ballet, competitive horse back riding and gymnastics, are discovered. Only then can you replace them thru selecting a more self-supportive more balanced approach to movement. This work proves beneficial to anyone, not just athletes or dancers, who wants a better working, toned, and sculpted body. I use the Gyrotonic machines, I also use mats and blocks, hands and body weight and intuition. 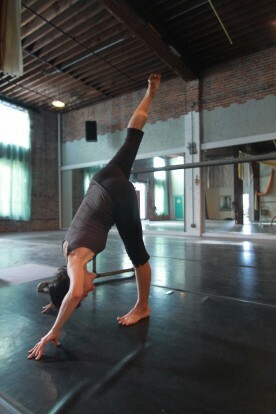 My teaching is derived from a combination of yoga practices, my education in Gyrotonic TM, experience as a professional ballerina, Baroque and Modern dance, training in the Alexander Technique, and cranial sacral and E-stem acupuncture.. The Gyrotonic Expansion System and the Katonah Yoga practice, both Taoist based philosophies, are my main influences. The Katonah Yoga uses the formal archetypal forms and organizes the body to attain 90 degree angles which best support and informs a body. With 4 clean corners of the torso, which is your personal doorway you take every step through, we become a better housing, and create optimal function for our organs and glands. All in all we get better information because we can step out of the personal and find and guide by orientation. The healing action of spiral movement combined with undulating wave motion so indicative of the Gyrotonic principles conditions the nervous system while lubricating the joints. The vitality of the body thrives on circular motion. save for later- The inherent beauty of a body that we are all born with is unlearned over time as we adapt thru necessity to this challenging world around us. Techniques to stop and listen to how we have all compensated allow us to restore the original "software package" that was pretty perfect. The process is more like taking away, not about adding to. Like any esoteric practice it is like peeling an onion. we are either integrating or disintegrating so wholeness in the body is recommended!